Parenteral products should be visually inspected for particulate matter and discoloration prior to administration. To ensure proper dosing, it is important to follow the preparation and administration instructions. VIVITROL must be suspended only in the diluent supplied in the carton and must be administered only with one of the administration needles supplied in the carton. The microspheres, diluent, preparation needle, and an administration needle with needle protection device are required for preparation and administration. Two thin-walled 1 1/2-inch needles with needle protection device and two 2-inch thin-walled needles with needle protection device have been provided to accommodate varying patient body habitus. For patients with a larger amount of subcutaneous tissue overlying the gluteal muscle, the administering healthcare provider may utilize the supplied 2-inch needle with needle protection device to help ensure that the injectate reaches the intramuscular mass. For very lean patients, the 1 1/2-inch needle may be appropriate to prevent the needle contacting the periosteum. Either needle may be used for patients with average body habitus. A spare administration needle of each size is provided in case of clogging. Do not substitute any other components for the components of the carton. Prior to preparation, allow drug to reach room temperature (approximately 45 minutes). Parenteral products should be visually inspected for particulate matter and discoloration prior to administration whenever solution and container permit. A properly mixed suspension will be milky white, will not contain clumps, and will move freely down the wall of the vial. Product to be prepared and administered by a healthcare provider. Prepare and administer the VIVITROL suspension using aseptic technique. Do not intentionally disengage the needle protection device. Discard bent or damaged needle into a sharps container and use the spare needle provided. Do not attempt to straighten the needle or engage needle protection device if the needle is bent or damaged. Do not mishandle the needle protection device in a way that could lead to protrusion of the needle. Do not use free hand to press sheath over needle. The entire carton should be stored in the refrigerator (2-8°C, 36-46°F). Unrefrigerated, VIVITROL microspheres can be stored at temperatures not exceeding 25°C (77°F) for no more than 7 days prior to administration. Do not expose unrefrigerated product to temperatures above 25°C (77°F). VIVITROL should not be frozen. See Prescribing Information for complete directions for use. 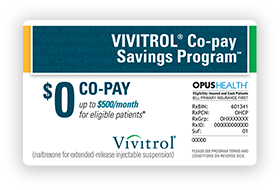 Do your patients need help paying for VIVITROL?